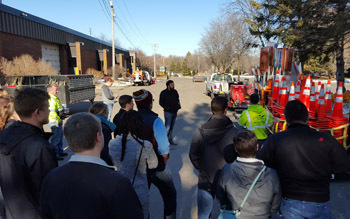 On Friday, December 4, several public works professionals from throughout the metro met at the City of Golden Valley’s public works facility for a first-hand look at Golden Valley’s customized and innovative equipment. Marshall Beugen, a member of the city’s street maintenance division, guided the group through the various pieces of equipment. Marshall and his public works coworkers have worked to create the following pieces of customized equipment: manhole ring adjusting trailer, emergency traffic control trailer, concrete form hook-box, and V-box salt spreader equipped with various snow removal tools and fuel supply. By customizing their equipment to fit the specific need, Golden Valley staff has been able to reduce mobilization time, increase productivity, and increase efficiency. Marshall advocates for thinking outside of the box when it comes to daily activities -- when an opportunity to be more efficient presents itself, be proactive and consider a change to your operating procedures. 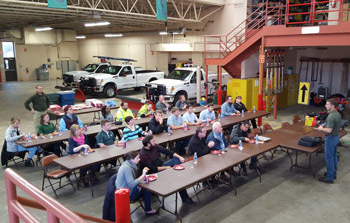 This event was hosted by the chapter’s Young Professionals Group and was open to any public works professional. It is the first of what will hopefully be several future public works facility tours. While most public works organizations work to serve a similar purpose, there are many creative and innovative practices taking place from facility to facility that everyone could benefit from seeing. If you would like to volunteer your facility for a future tour, please contact Eric Seaburg at ESeaburg@goldenvalleymn.gov.